The 3M� DBI-SALA� Clip2Clip Coil Tether is a non-conductive vinyl coil that is engineered to withstand harsh work environments. 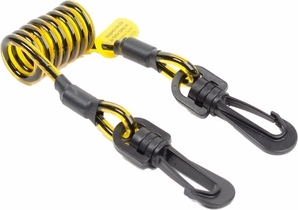 The compact design of the tether keeps the lanyard out of the way when not in use, and extends to 24" when stretched. Coils down to 1.75 in. (4.4 cm) and stretches out to 24 in. (70 cm) to stay out of the workers way. Compact and lightweight, these clips are quick and easy to attach and are ideal for wristbands when a non-conductive tether is required.